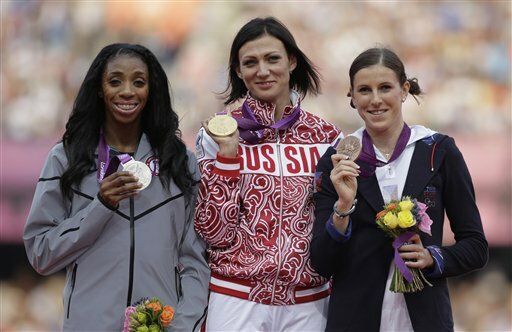 James Sullivan is back with part 3 of his A-Z review of the 2012 athletics year. For over a decade now the Middle-Eastern nation of Qatar has had a very negative impact on athletics with their policy of buying in world class Kenyan athletes to run for the arid nation. However London 2012 provided a moment of genuine real success for the country. Mutaz Essa Barshim claimed bronze in the men’s high jump with a leap of 2.29m, sharing the third spot on the podium with Great Britain’s Robbie Grabarz and Canadian Derek Drouin. This was just the second ever athletics medal won by Qatar in Olympic history, coming 20 years after Mohammed Sulaiman took bronze in the 1500m in Barcelona. The event was won by the eccentric Russian athlete Ivan Ukhov who jumped 2.38m to convincingly take the gold medal ahead of Erik Kynard Jr of the USA by a margin of 5cm. Usain Bolt may have received the vast majority of media’s plaudits throughout London 2012, but arguably the performance of the Games came from David Rudisha. 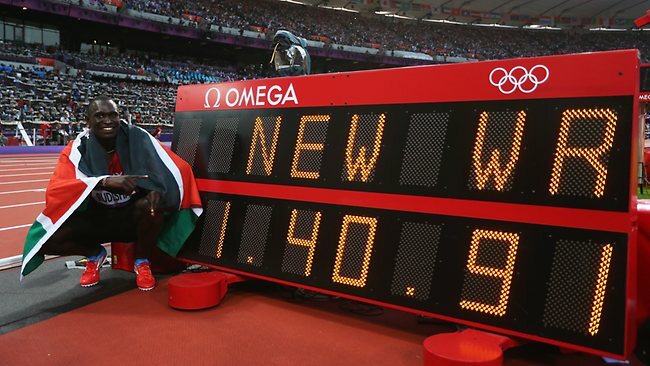 The Kenyan 800m runner has been virtually unbeatable over the last two years, breaking the long standing 2-lap record held by Denmark’s Wilson Kipketer, not once, but twice in 2010 and claiming World Championship gold in Daegu the following year. The 23 year old entered London as possibly the most overwhelming favourite in all of track and field, and he did not disappoint, leading from the gun to claim gold in a staggering world record time of 1:40.91, becoming the first man in history to dip below 1:41. What made this performance all the more remarkable is that it was achieved without the aid of a pacemaker. In this day and age, in events from 800m and up, a world record being set during a major championship is completely unheard of. It does not bear thinking what this man may run over the coming year in a properly paced Diamond League race, with many believing that he is destined to break the 1:40 barrier. It is also worth noting that all 8 men in the Olympic final ran sub 1:44, with the eight placed runner, Great Britain’s Andrew Osagie, clocking a time which would have won gold at the previous three Olympics. However, the record breaking performances of the other seven men will be merely a footnote to David Rudisha in Olympic history. There can be no getting away from the fact that the performance of the Irish athletics team as a whole at London 2012 was disappointing. What makes this all the more frustrating is the fact that three seriously talented young athletes on B-Standards (Mark English, Brian Gregan and Jessie Barr), who were in form, and have recent championship pedigree, were not selected to compete in London. The OCI’s lack of foresight, logic and ability to see anything other than black and white meant that only athletes with A-Standards were selected to compete, resulting in English and Gregan being left at home, while Barr was ludicrously left up in the stands of the Olympic Stadium, as she was in London for the 4x400m relay anyway, thus robbing these great prospects of valuable Olympic experience ahead of the next Games in Rio de Janeiro. It is very possible that all three of the mentioned athletes above would have made the semi-finals of their respective events in London, and had common sense prevailed, we’d be looking at Irish athletics right now from a completely different viewpoint, full of positivity for what lies ahead over the coming years. While the athletes themselves must take responsibility for their own performances, much of the blame has to lie with those responsible for selecting what had been hailed as the best prepared Irish team in history, those who overlooked the likes of English, Gregan and Barr, while selecting athletes who had achieved A-Standards back in 2011 but hadn’t performed close to the required level in 2012. Furthermore the black and white nature of the A-Standard requirement resulted in athletes traipsing around Europe right up to selection deadline day in a desperate hope of securing a qualification time. With a system like this in place, even if an athlete did manage to secure a ticket to the Games, it is highly unlikely that he/she would be able to peak again in London just a month later. Hopefully the OCI and AAI will learn the harsh lessons from London 2012 and will bring in an effective selection process for Rio 2016, which ensures the best athletes are chosen to represent Ireland. There’s an unprecedented level of talent coming through in Irish athletics. Let’s hope this talent is nurtured by the AAI, and that the same issues will not be discussed again four years from now. In Ireland athletics is firmly a minority sport, and with such status comes less television and general media coverage than some of the more popular field sports such as GAA, soccer and rugby. A side effect of this is that in the rare event the sport is covered by RTE the presenters are generally lacking in knowledge and poorly prepared. The London Olympics provided some cringeworthy clangers, in particular veteran anchor Bill O’Herlihy questioning why the Kenyan women had only won one steeplechase Olympic gold, while the men had claimed nine, clearly oblivious to the fact the event was only introduced to the programme in recent years. While such moments are no doubt funny, it is not often the sport gets such prime time coverage in Ireland, and it would be nice to see the sport respected, with the presenters doing proper research. Irish athletics deserves better. In recent years the world of men’s marathon running has been completely dominated by Kenya, with Ethiopia playing a supporting role. Given this fact, the event produced perhaps one of the biggest upsets of London 2012, with Ugandan Stephen Kiprotich claiming his country’s first Olympic gold medal since the late John Akii-Bua won the 400m Hurdles at the 1972 Munich Games. With a personal best of 2:07:20, the 23 year old defeated competitors who had lifetime bests in excess of three minutes faster. Perhaps the Kenyans need to practice actually racing the iconic 26.2 mile distance. In recent years the event has become one time trial after another, with athletes following strictly instructed pacemakers in an effort to set world record after world record. Maybe it is just me, but the event has lost its romance, and perhaps Kiprotich’s victory is just the thing the marathon needs. Another athlete who achieved considerable success in 2012 was Valerie Adams. The Kiwi athlete has been the dominant force in the shot putt in recent years claiming Olympic gold in Beijing and three consecutive victories at the World Championships. However victory in 2012 wasn’t achieved in the conventional method. Having started the year brilliantly with gold at the World Indoor Championships in Istanbul, the New Zealander entered London as favourite to defend her Olympic title. However she was beaten into second place by a very masculine looking female from Belarus by the name of Nadzeya Ostapchuk, an athlete who was referred to by RTE’s Victor Costello as a Shane Byrne look-a-like (former Irish front row rugby player). Alas, the joy did not last long for the Belarusian as she subsequently tested positive for the banned substance metenolone. She was swiftly stripped of the title with the gold medal being awarded to Adams. Certainly not the manner in which the Kiwi thrower would have liked to achieve Olympic glory, and indeed she made reference to how she could never forgive Ostapchuk for stealing the moment of victory from her. 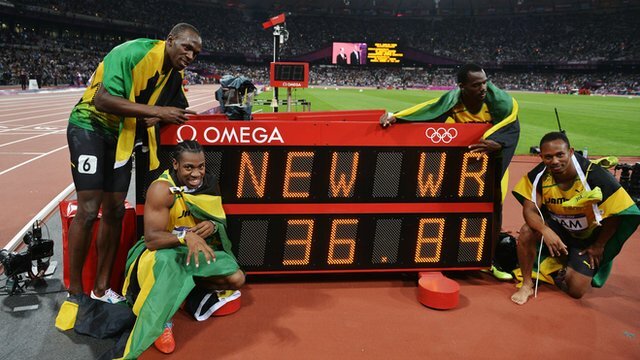 Rudisha wasn’t the only record breaker at London 2012 however. Three other world records were set during the athletics programme. The US women’s 4x100m relay team of Tianna Madison, Allyson Felix, Bianca Knight and Carmelita Jeter annihilated the old record by over half a second, with a remarkable clocking of 40.82. This performance was all the more incredible given the fact that the old record, a tainted mark held by East Germany, had lasted a dominant 27 years. The men’s 4x100m world record was also broken, with the Jamaican quartet of Nesta Carter, Michael Frater, Yohan Blake and Usain Bolt recording a sensational 36.84, the first sub 37 second clocking in history, while Russian Elena Lashmanova set a new standard of 1:25:02 in the women’s 20k Walk overhauling serial championship gold medalist and fellow countrywoman Olga Kaniskina in the dying stages of the race. Szentendre, Hungary played host to one of the more memorable moments in Irish athletics in recent years. On 9th December Ireland picked up not one, but two gold medals at the European Cross Country Championships. Wicklow athlete, Fionnuala Britton brilliantly defended the title she won at Velenje, Slovenia 12 months previously, defeating European 10000m Champion Ana Dulce Felix of Portugal by two seconds in tough snowy conditions, in the process becoming the first female to claim back to back titles in the senior race in the 19 year history of event. Britton also played a pivotal role in helping the Irish senior women to claim the team title for the first time. The team of Fionnuala Britton, Linda Byrne (8th), Ava Hutchinson (20th), Lizzie Lee (23rd), Sarah McCormack (36th) and Sara Treacy (42nd) took the gold with a combined score of 52 points, edging the French on countback. With this victory behind them, and the return to form of Mary Cullen, the Irish women can approach the upcoming World Cross-Country Championships with a lot of confidence and optimism. Long time the dominant force in women’s pole vault, Yelena Isinbayeva hasn’t had it all her own way since her Olympic gold medal triumph in Beijing. The twice World and Olympic champion failed to medal at both the 2009 and 2011 World Championships in Berlin and Daegu respectively. However with an indoor world record of 5.01m set in Stockholm in February 2012 and World Indoor gold a few weeks later in Istanbul the Russian set herself up as the gold medal favourite for the London Olympics. However she could do no better than finish in the bronze medal position with a clearance of 4.70m, with American Jennifer Suhr defeating Cuba’s Yarisley Silva to the gold on countback, with both clearing 4.75m. The defeat fully signalled an end of an era in women’s pole vaulting. The 2013 Moscow World Championships are rumoured to be Isinbayeva’s swansong, where this great ambassador for athletics will hope to end a long career with gold in front of her home crowd. While not a gold medallist from London, Zuzana Hejnova is as worthy an entry for the letter Z as any in 2012. Having underperformed at the 2011 World Championships in Daegu and the 2012 European Championships in Helsinki, the 25 year old Czech athlete had a superb Olympic Games, claiming the bronze medal in the 400m Hurdles with an impressive clocking of 53.38 seconds, just 0.09 off her national record. The race was won by Russian Natalya Antyukh with a sensational world leading time of 52.70, edging defending world champion Lashinda Demus in an epic battle by just 0.07 seconds. This is the final part of James’ review of 2012. Read Part 1 here and Part 2 here.